You can take advantage of these transits and all of the blessings they bestow by aligning yourself with their respective energies. The Sun conjunct Jupiter combines confidence with optimism, while the Venus trine Neptune aspect brings in elements of faith and hope. Rather that seeing yourself tied to that karmic wheel today, consider participating in your destiny and working on overcoming the conditioning that’s held you there in the past. 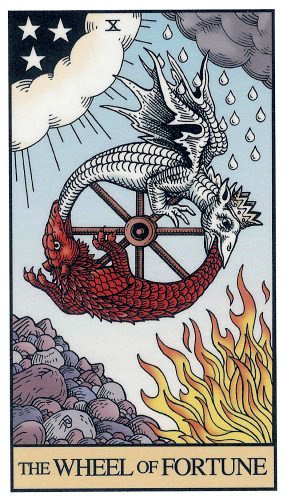 Today’s card — Wheel of Fortune — comes from the Alchemical Tarot Renewed by author/artist Robert M Place, published by Hermes Publications through the Alchemical Egg. Used by generous permission. This deck is also available as an Iphone, Ipod and Ipad app through Itunes. 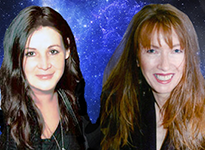 Please visit and “like” the deck’s Facebook Fan page.